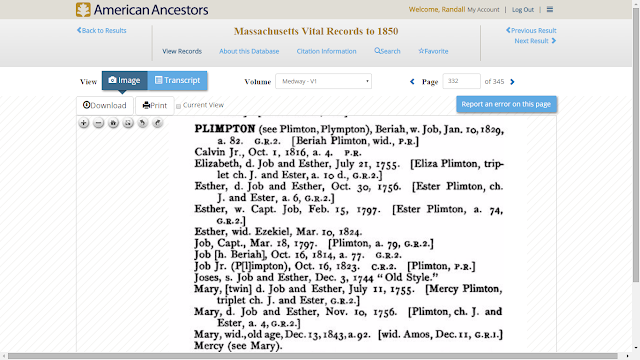 I wrote Amanuensis Monday - Post 309: 1807 Will of Amos Plimpton (1735-1808) of Medfield, Mass.on 2 March 2016, which left a considerable bequest to his second wife, Mary (--?--) (Breck) Plimpton "as long as she remains my widow." Levi B. Chase, A Genealogy and Historical Notices of the Family of Plimpton or Plympton in America, Plumpton in England (Hartford, Conn. : Plimpton Mfg. Co., Print, 1884). "Amos (39) b. June 16, 1735, d. 1808; m. first, 1756, Mary Guild, of Walpole, b. 1735, d. 1800; m. second, widow Mary Breck, of Sherborne, d. in Medway." I don't know if that's correct, but it identifies "widow Mary Breck" being "of Sherborne" and dying in Medway. "[PLIMPTON] Mary, wid., old age, Dec. 13, 1843, a. 92 [wid. Amos, Dec 11, G.R. 1]"
The "G.R.1" in the entry means that there is a graveyard record. Is there one on Find A Grave or another site? "[PRATT] Mary and Elijah Breck, Jr., Feb. 6, 1792*." "[PRATT] Mary, d. of Gershom and Abigail, May 28, 1750." * Born 28 May 1750 in Sherborn, Mass., daughter of Gershom and Abigail (Rice) Pratt. * Married Elijah Breck, Jr. on 6 February 1792 in Sherborn, Mass. * As Mary Breck, Married Amos Plimpton on 6 November 1800 in Medfield, Mass. * Died 11 December 1843 in Medway, Mass. Her gravestone indicates that she was "Mrs. Mary," the "widow of Amos Plimpton." * Born 19 July 1753 in Sherborn, Mass., the son of Elijah and Sarah (Hill) Breck. 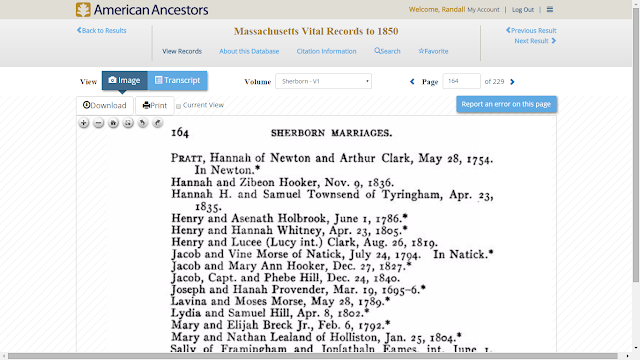 * Married (1) Hannah Prentiss in Sherborn, Mass. on 7 May 1789. 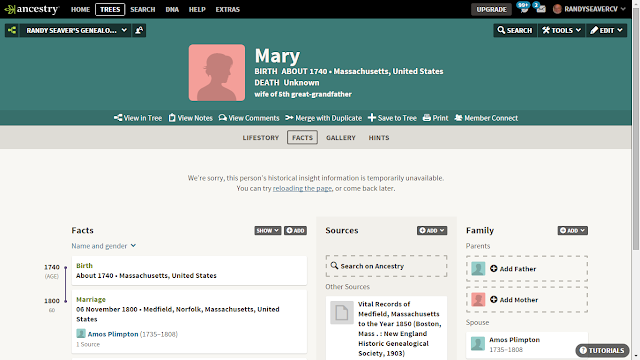 Hannah Prentiss died 9 January 1791 in Sherborn, Mass. * Married Mary Pratt on 6 February 1792 in Sherborn, Mass. * died 26 June 1795 in Sherborn, Mass. So the names, dates and places are pretty consistent. 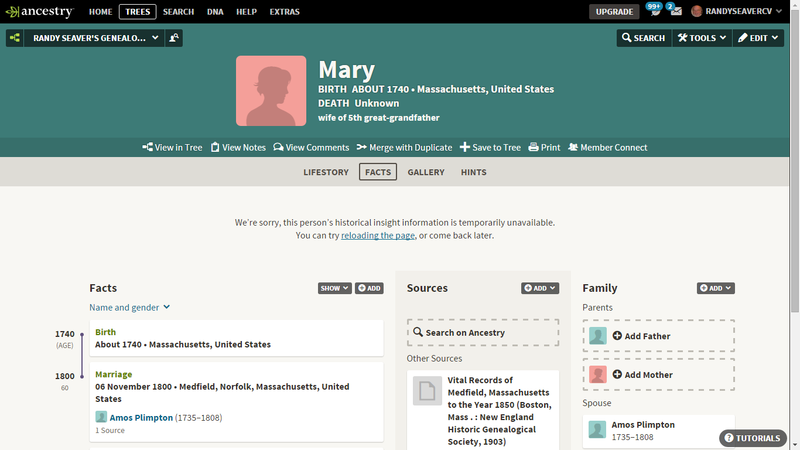 I love Massachusetts Vital Record books! What surprised me was that Mary (Pratt) (Breck) Plimpton survived her second husband for 35 years. In the will of Amos Plimpton, his beloved wife Mary was bequeathed to be provided, by the children of Amos: "...it is my will that she shall receive annually out of my estate for her support eight cords of good fire wood brought to the door and cut fit for the fire, five Bushells of Indian Corn, five bushells of Rye, one bushell of Matt, one barrell of Cyder, sixty pounds of Pork, fifty pounds of Beef, sixty pounds of good Cheese, thirty pounds of Butter, ten pounds of Flax and five pounds of Sheep's Wool, with a sufficiency of same of all kinds. I also give her all of the furniture which she brought with her when I married her to be at her disposall forever. Also one Cow at her disposal." Of all of the five Amos Plimpton's children by his first wife, Mary Guild, three died soon after birth. Only Molly Plimpton (1758-1813) and her husband, Amos Kingsbury (1759-1842) and Mercy Plimpton (1772-1850) and her husband, Aaron Smith (1765-1841) survived Amos, and only Amos's daughter Mercy (Plimpton) Smith survived Mary (Pratt) (Breck) Plimpton. I wonder if my 4th great-grandmother Mercy (Plimpton) Smith delivered the yearly support to her step-mother for 35 years until her death? I would like to believe that, but who knows? 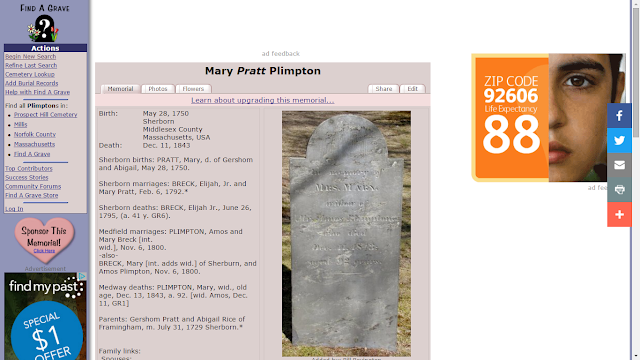 I think that I have found a maiden name, a birth date, parents names, the name and vital information for her first husband, and a death date and burial place of Mary (Pratt) (Breck) Plimpton. While she is not my ancestor, she certainly is part of my family history. Doesn't Mary's first marriage at age 42 seem a bit odd for that time? Normally one would find a first marriages at a much earlier age. I would look for an earlier marriage or perhaps there was another Mary Pratt. I've found that Find-A-Grave information isn't always reliable. That is so great to finally identify her! Thanks for posting.